Forty percent of all American households have a firearm, and eight children aged 19 and younger are killed every day in the United States by a bullet! Most of these deaths are preventable. Additionally, because children are exposed to firearms through the media (television, video games, online), they may be receiving inaccurate information about firearm safety. Ask if firearms are stored where your children visit or play, including the homes of family members. Talk to your children about guns. Many children, and even adults, cannot differentiate between a toy gun and real gun. Therefore, tell your children to treat every firearm as though it is real and loaded, never to touch guns, and to locate an adult immediately when they find one. Make sure that they know that firearms are never allowed in a school environment, and to tell a teacher if he/she suspects that someone may possess a firearm. What simple phrase resonates with children regarding firearm safety? Please know that MORE HEALTH continues to partner with law enforcement to spread the message of violence prevention through our innovative lessons. We teach students and teachers a simple phrase that resonates with all when coming upon a firearm. HALT! HANDS OFF! GET OUT! GET HELP! How do I practice responsible firearm ownership? Lock the unloaded firearm away and keep it out of reach of children. Hiding the weapon is NOT enough! Store and lock the ammunition separately from the firearm. Keep the key(s) to the locked firearm and ammunition out of reach. Make sure all firearms are equipped with child-resistant gun locks. And keep firearm cleaning supplies locked and away from children as well. These chemicals can be harmful. How should I dispose of my firearm? 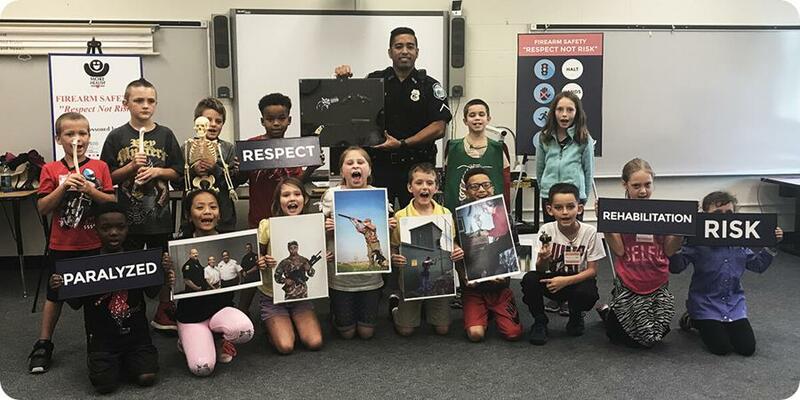 Over the years MORE HEALTH has had the privilege of working with local law enforcement in providing firearm safety education to students in the Tampa Bay area. If you should decide that you no longer want a gun in your home, make sure to dispose of it in a safe way. Please call your local law enforcement office to inquire about proper disposal protocols.